A few hours ago, I learned that a notable writer wrote into The New York Post to express his disguised hatred for his ex-girlfriend. 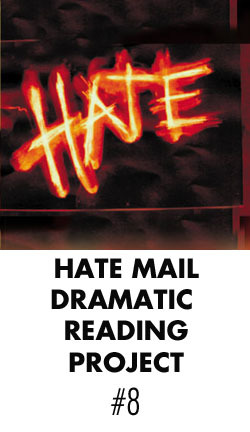 The following clip represents my dramatic reading of the hate mail in question, read in the style of Jimmy Stewart. Wow. I daydream about getting hate mail. Some guys get all the luck!